Very Berry Cake came about due to an excess in berries I acquired when I went to the store last week. I seriously adore this time of the year because of all the fresh fruit! I can’t wait to go picking berries soon! We live on the countryside and we have tones of places around us where we can pick blueberries, strawberries, raspberries, black raspberries, asparagus, peas, lavender. You name it! And I am keeping my ears and eyes open because the picking season for some of these can be very short, like a week long sometimes! Last year I missed the lavender picking! But I won’t make the same mistake this year. About blueberries, though, we literally went every week, sometimes twice a week, to pick blueberries. I froze a bunch. And I also baked a bunch, of course. Not to mention the delicious smoothies topped with fresh fruit we ate every morning! Smoothies, Oatmeal, Pancakes! Everything! I just sprinkled those huge, juicy blueberries over everything! So, let’s talk about this Very Berry Cake. The cake is a vanilla sheet cake. The moistest of all. I also include the recipe for a milk syrup I like to brush on my cake. It really makes a difference. I usually use simple syrup for most of my cakes, but I liked the sweet milky syrup for this one! 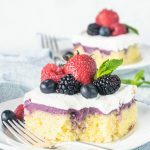 It only made this Very Berry Cake even more delicious! 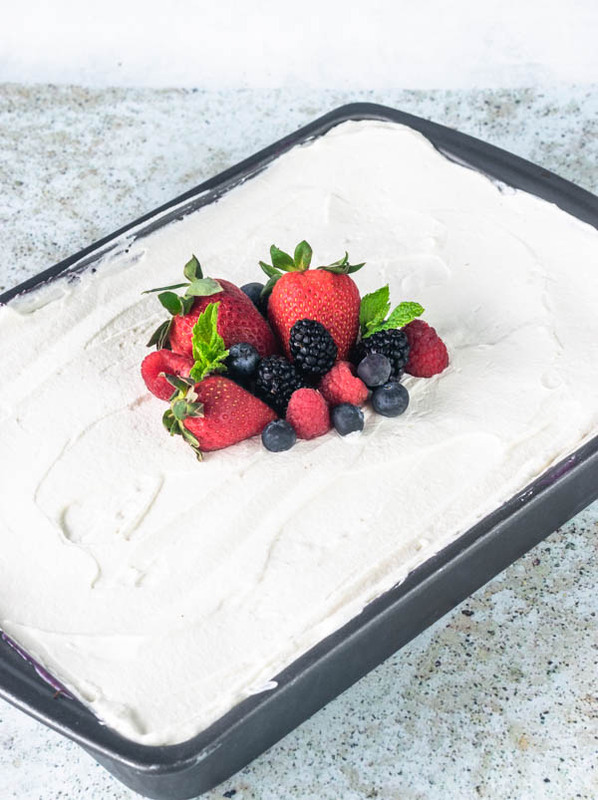 On top of the vanilla sheet cake, we pour a delicious Very Berry frosting! It’s not a usual frosting like a buttercream. It’s a boiled frosting, made with condensed milk, berry jam, heavy cream, and a bit of butter. This frosting can be used to fill your cakes and such. It will become solid once refrigerated, but not hard, just fudgy and delicious! On top of the Very Berry frosting, I put some Whipped Cream, very lightly sweetened, because the Berry frosting tends to be quite sweet. And of course, a Very Berry Cake needs berries right on top. The freshest and plumpest ones you can find! Seriously, what a refreshing treat this cake was! The perfect summer cake! It’s worth it turning the oven on for those 20 minutes to bake the cake. Picture this. You come back from work, or from shopping, golfing, swimming class, or whatever it is that you do, and you open the fridge! 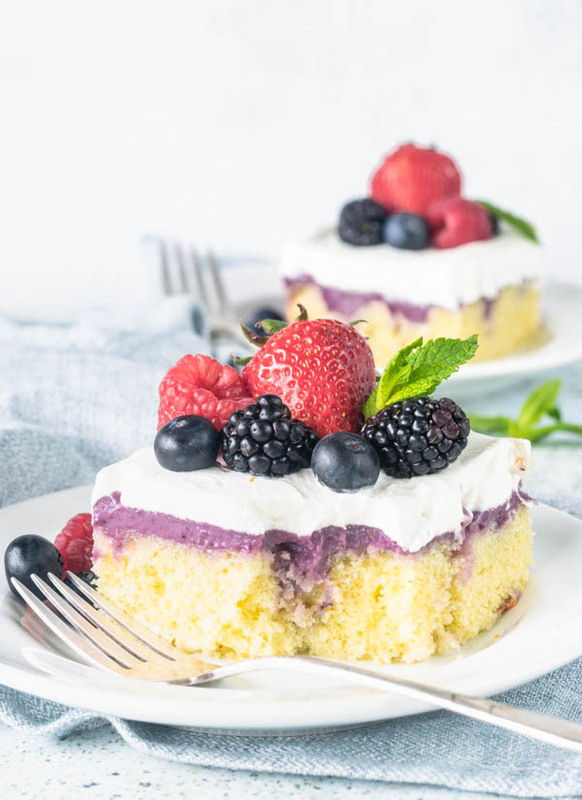 This beautiful refreshing Very Berry Cake stares right in your eyes! That’s when life starts to make sense! You deserve this treat! For more summer treats that you deserve, check out: Banana Cream and Raspberry Jam Pie, Pineapple and Strawberry Layer Cake, Cherry Cupcakes. 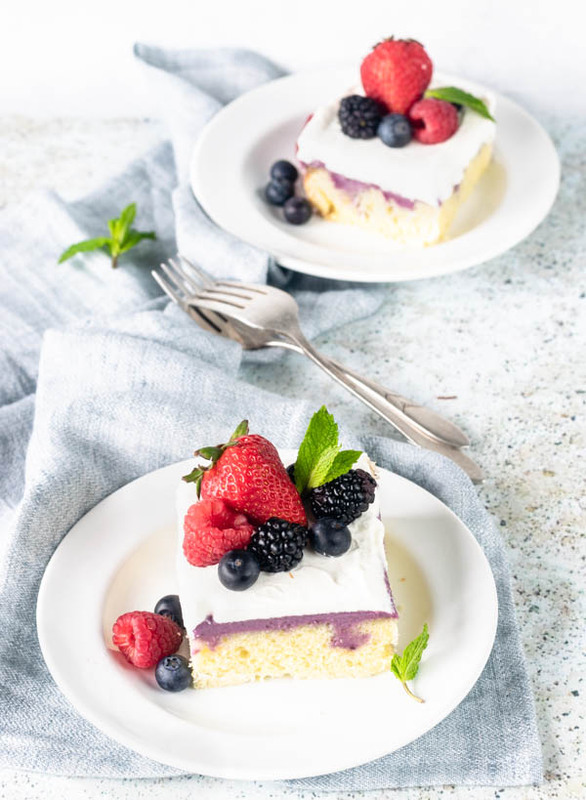 Get the flavors of Summer with this Very Berry Cake! 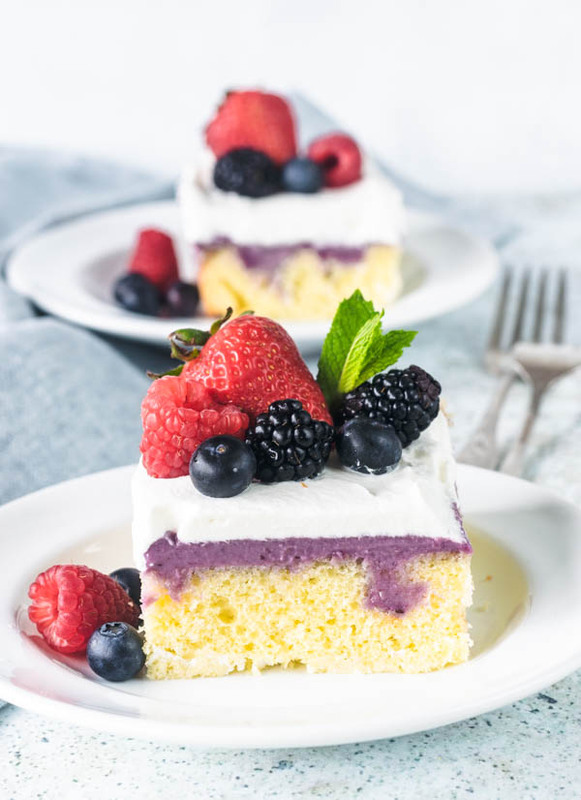 Vanilla Cake, covered with a Very Berry frosting and Whipped Cream! The final touch are fresh berries on top! Pre-heat oven to 350F. Grease a 9x13” pan with butter, sprinkle flour over, evenly. Set aside. Sift flour, baking powder, baking soda and table salt together. Set aside. In the bowl of a stand mixer, beat butter at medium high speed for 1 minute. Add sugar and keep creaming mixture on medium speed for another minute or so. Butter and sugar should look very fluffy and lightened in color. Add eggs one at a time, mixing thoroughly before adding another egg. Add 1/3 of the flour mixture. Stir to combine. Add half of the buttermilk. Stir to combine. Now, add another 1/3 of the flour mixture. Stir until just combined. Add the last of the buttermilk. Stir to combine. Finally, add the last 1/3 of the flour. Fold until you see no more streaks of flour. Pour batter onto prepared pan. Bake for 20-30 minutes, until cake is golden on top and a toothpick comes out clean when inserted in the cake. Add all ingredients to a medium saucepan. Over medium heat, stir with a wooden spoon or spatula while it comes to a boil. Once it boils, do not stop stirring. It’s very important that you keep stirring this mixture, otherwise it will stick to the bottom of the pan and burn. Once it comes to a boil, you are going to keep stirring and let it boil for about 5-10 minutes, until mixture is thick and you can see the bottom of the pan when you run the spatula through it. Remove from heat and let it cool for 5-10 minutes, until cream is warm and not piping hot any longer. If you’ve got large berries such as strawberries, you want to chop them up before starting. Add all berries to a medium sauce pan. Mix all ingredients in. Bring to a boil. Reduce heat to medium-low. Let jam simmer and reduce, while stirring occasionally. Use your spoon to mash berries against sides of the pan. Cook jam for 15-20 minutes, until reduced and thickened. Pour through a strainer, making sure to squeeze berries with the back of a spoon so you get all of the liquid out. Put it in the fridge until ready to use. On high, whip cream with sugar and vanilla until thickened, about 3 minutes. Make sure cream is very cold. Sometimes I like to stick my mixer bowl and whisk attachment in the freezer to make them really cold. That really helps in obtaining a more stable whipped cream! Bring milk and sugar just to a boil, until sugar dissolves. Set aside to cool completely. Once cake has been baked, poke it with a fork. Pour milk syrup evenly all over cake. Make sure to do this slowly, so you get a little bit of syrup all over the cake. Pour slightly cooled down Very Berry Frosting over cake. Spread with a spatula. Put it in the refrigerator to cool. After a couple hours, make whipped cream. Pull cake out of refrigerator. Spread Whipped cream over hardened Berry frosting. Top with fresh berries! Serve! STORAGE: Cake will keep well in the fridge for up to 3 days, if it's covered and well protected so it doesn't dry out. Oh wow, that frosting (berry one!) sounds incredible! I’m a huge blueberry fan too. This will be great to make when the kids come home! Yes, Shelby! That frosting is like my favorite thing ever! Thanks!! This sounds delicious. It’s soon putting me in the mood for cake and summer. I’m definitely try this. This cake looks simply amazing! I loved how you layered with berry jam first to add more flavors to it! Absolutely worth trying. 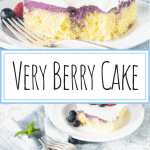 This sounds amazing and love how the blueberry jam as seeped into the cake. Not only does it look pretty, but I’m sure it tastes delicious! Great idea for when you have a fruit glut – sadly never the case where I live. Love the fruit seeping purple into the cake under the icing. This cake looks sensational and so delicious! The layers are so pretty, especially the very berry frosting. Perfect to serve at a summer party! Such a delicious looking cake. I love fresh berries but unfortunately have to wait till I travel to UK or Canada to enjoy them as we don’t get them readily in Kenya. I’ve never tried a condensed milk frosting but it sounds good. Love reading your cake recipes! They all sound and look heavenly. I love cakes that are topped with fresh berries. Is the texture of this cake light? Yes very light and fluffy!! Thank you so much, April! This looks so light and delicious! Love it! Perfect for a summer dessert after a hot day!